RPM Diesel Engine Co., Inc is extremely proud to be one of the few select Authorized Bosch Common Rail Rebuild & Fuel Injector Facilities in Florida. Bosch EPS815 test bench, capable of testing Bosch CRI, CRIN, CRIN I, II, III and IV injectors, CP1, CP2, CP3 and CP4 common rail fuel pumps. OE coverage includes MTU, MAN, Volvo Penta, Cummins, Chevrolet, Dodge, Ford, Mercedes and many other on highway and off highway applications. We are 1 of 2 Bosch factory authorized repair shops in Broward and Dade counties. EPS815 is capable of “shot to shot” metering, capable of measuring to 1/10 of one cubic millimeter between firing events. Computer based assembly of fuel injectors. 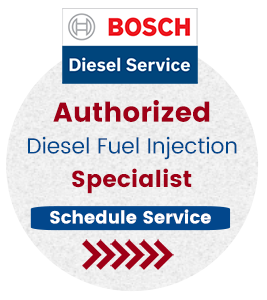 What does being an Authorized Bosch Diesel Factory Repair Shop mean? Essentially it means we have met strict specification for training and have the tools, test equipment, parts, and training directly from the manufacturers of the fuel injection components. This also means that the fuel injector and common rails products that you receive from us were assembled to the most exacting specs established by the manufacturer for verified diesel equipment that was designed and built by the manufacturers themselves. This permits us to sell genuine products that are equal to that from the manufacturer itself. Non-compliant and unauthorized third party shops don’t get the training and have the proper equipment to rebuild common rail injectors and are basically guessing. Do not guess when it comes to your Common Rail Injector Service. Any Bosch Common Rail Fuel Injector that is assembled or repaired is done so in our Bosch certified clean room. A Bosch Certified Clean Room with hepa filtered air allows the atmosphere to maintain the most incredibly tight tolerances that these diesel fuel injectors require to function correctly. From beginning to end the complete fuel injector assembly is laid out and checked all during the process by Bosch’s proprietary software. Bosch software determines the correct shims by using exact measurements that are taken from each injector on the common rail and then compared against factory specifications. Every piece of our measurement tooling is strictly required to have recalibration performed every seven to fourteen days to maintain the best accuracy. When we assemble any common rail injector, we have the ability to choose from a wide array (500 plus) of different sized shims. Precision shims for common rail are only available to Bosch Factory Authorized repair shops. During every common rail assembly and repair, each fuel injector is thoroughly tested and verified on our Bosch test bench. 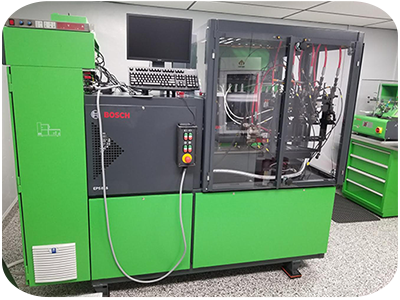 Our Bosch EPS 815 test bench is equipped with the CRI/CRIN SST package and allows us to test all passenger car (CRI) and commercial (CRIN) common rail injectors plus CRIN I, II, III and IV injectors, CP1, CP2, CP3 and CP4 common rail fuel pumps manufactured by Bosch. The Bosch test bench utilizes specifications that are derived directly from the common rail equipment that are used on the assembly line at the Bosch factory. What this does is that it guarantees that the diesel injector will operate according to manufacturer specs and strict emission levels as engineered by the OEM (Original Equipment Manufacturer). Each diesel fuel injector undergoes a thorough examination for Shot-to-Shot consistency and repeatability. Our Bosch EPS815 test bench is capable of “Shot to Shot” metering, capable of measuring to 1/10 of one cubic millimeter between firing events. Shot-to-Shot testing is crucial to ensure that the diesel fuel injector is mechanically functioning to the exacting specs that it has been electronically commanded.